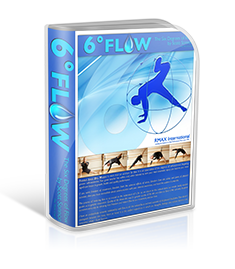 6 Degree Flow is a highly thought out, plug and play, portable, BODY WEIGHT training system, that is designed to use BODY-WEIGHT exercises as a vehicle for EXPERIENCING flow state. I can personally attest to the power of EXPERIENCING flow state on a consistent basis and ability it possess in healing nervous, immune and endocrine systems simultaneously. Flow state, is a powerful ally in our TRANS FORMATIVE process and anyway that we can enter it more often is going to be beneficial to us INDIVIDUALLy, and to those around us, through, the outgrowth we EXPERIENCE socially. Training can be so much broader, and posses so much more depth than what we are bombarded with through propaganda and social media. Idea's surrounding fitness, strength, flexibility and conditioning are the primary drivers of our current culture, and while these traits can be nice, they fall short as methods of "total human growth". Physical training, though only one level of the human experience, can create a cascade of effects that reaches into our spirit, and shapes not just our structure, but also our souls. As we develop freedom of movement, we can also begin to cast off the shackles that hold us prisoner in other areas. As we become more malleable in form, our minds become more capable of fluidity as well. As we increase flow in training, we bring more flow into our daily lives. Though this program does have conditioning and strength effects, they are secondary and not the main point..... the purpose of this program is unleash your innate capacity to flow. Flow is an altered state of consciousness where action and awareness merge, the difficult becomes effortless, our decision making speed and capacity are at their peak, and we feel a sense of euphoric oneness. Flow state as it is now referred to was once the exclusive domain of mystics, master martial artist, elite athletes and genius scientist. It has had many names throughout the ages, but none of them were able to pin it down with any real certainty. It was Mihaly Csikszentmihalyi, in his ground breaking book, Flow: The Psychology of Optimal Experience, that gave these states the term "flow states", for the sensation of continuity they impart. Without having explored the topic extensively, it is easy to think of flow as a ephemeral, fluffy notion without a precise definition and for a long time, that is exactly what it was: a blanket statement for a certain set of sensations. These days however there is a "hard" science evolving in the arena of flow research, and it illuminates the state as the peak human performance state. 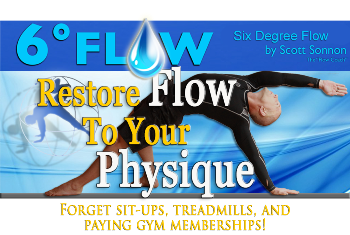 Scott Sonnon's 6 degree flow program is at the forefront of this research. Flow most often then not requires a high degree of skill in a particular craft or sport, because it occurs at the edge of our comfort zone, where you perceive yourself as having the necessary skills to meet high level challenges. Thus for a long time the depths of this state we most often experienced only by those who had put in many years of training into a field of study, building up and testing their skills. Even then the state was unreliable and difficult to predict, like any altered state of consciousness. This is what makes 6 degree flow such a unique product. Not only do you get a step by step prescription for flow, but you also, through reading the written material that comes with it, get an awesome introduction into the how and why of flow. Its teaches you how to get into flow more often. So, this program is also an introduction into flow state as a whole. 6 degree flow is one of the only programs on earth that was designed in a way that almost Guarantees a reliable way of entering flow state on a consistent basis. So what makes this program unique? This is still a "fitness program" that will deliver on some of the common things we think about when it comes to exercise, but the goals of the program are actually two fold. The two overarching goals of this program are to balance your structure from head to toe by removing your "chronic structural compensations", through a unique "camshaft" action which releases unnecessary chronic tension, and also of-course, to enter flow state consistently. You cannot compartmentalize a program likes this, because as you release some of the major sources of muscular "density", you unlock emotional holding patterns that are currently stuck in cold storage, and by consistently experiencing experience flow in one area of your life, it will leak over into the other areas. This program leads to structural balance through the use of concept from avionics called the 6 degrees of freedom, hence the name. The 6 degree's occur when you add rotation to each of the basic three axis's of movement, which include front/back, side/side, and up/down: like the figure show to the right. 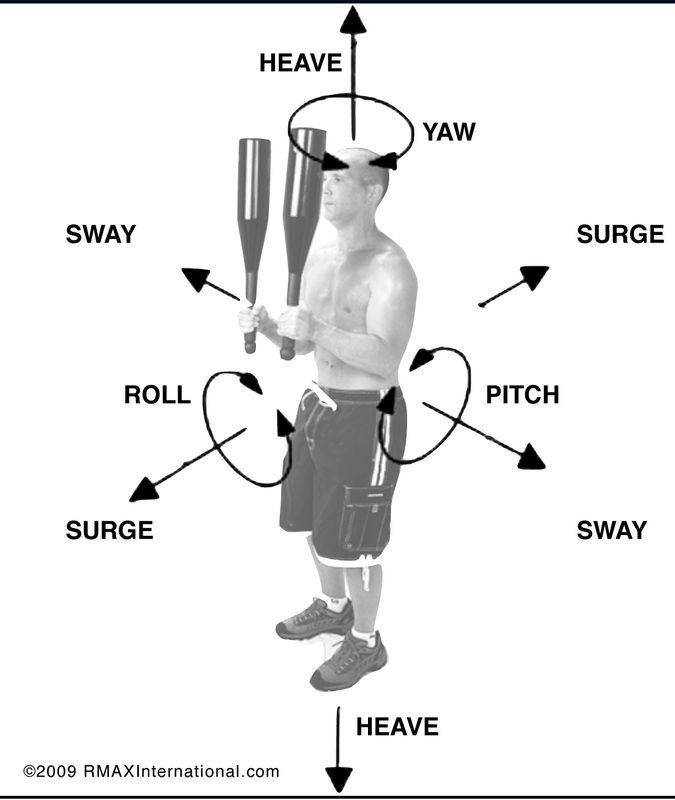 By combining one basic axis of movement with one type of rotation, and putting this into a continuous repetitive flow, your structure gets "cooked" and is encouraged to release and remold. So, if you complete the recommended cycles, you will exit this program a different person than when you went in, to some degree. There are ofcourse many ways to get the same results, but none as easily laid out as this, as far as I am aware. Crafted with a cutting edge understanding of the human animal's optimal bio-mechanics. So train safely folks. The bonuses in this program could almost be worth the price of admission by themselves, especially the unbinding program. Unbinding: A 21 minute head to toe joint mobility program designed to release our compensations and clean the slate of our structure. It helps remove old injuries, and pain while reducing stress and preparing your body to absorb the technique of your flows. This type of training is priceless for the long term health of your body and mind. Using, smooth and fluid movements, you tap into you "short range stiffness" and safely coax your nervous system into letting go of it's unnecessary braces of fear, stress or trauma. This program is worth cost of admission alone. Flowfit: Is an a 4 level, incrementally progressive, body weight flow. Its first level is accessible to those who can only get in and out of chairs, where as its upper levels will challenge even elite athletes. Prasara Yoga Demo: This demo DVD showcases five beautiful yoga flows, that move across a 6 degree's of freedom. Prasara is an ancient Sanskrit term meaning "flow without thought." There are many ways to enter flow state, and you do not need this program to do it. Flow state is fundamental to the functioning of the human organism, it is literally a part of us. However, there a few exercise programs specifically designed to take you to that place consistently. This program provides a set of skills and can offer you a whole new direction of how to pursue training as a vehicle for flow state, and for the mastery of technique that many of us would have to normally study a discipline like martial art to experience. For those of you who have been following me or know my story, you know that I have suffered from and have overcome a wide variety of health conditions, including hormonal dis-regulation, arthritis, and an highly intense kundalini awakening among other things, and have found flow state to be highly valuable. This program got me started on using training as a flow vehicle, and while I have currently outgrown it, the foundation it laid, changed the direction of my life. It was by first experiencing flow state in this format, that I have been able to infuse into other arena's. I will say however, that this form of training is not for the faint of heart, because flow is as much a state of heart and mind, as it is of body. This will make you face your weaknesses, limitations, fears and other forms of body armor. Some serious emotional material has surfaced for me, and at times, it has been uncomfortable but necessary. Body-weight flows cause you dump the volatile chemistry you have been holding onto. The first time my wife performed one, she broke down in tears, and experienced some important existenstial realizations. So approach this with the intent of transforming and expanding as a person and not just "getting ripped".